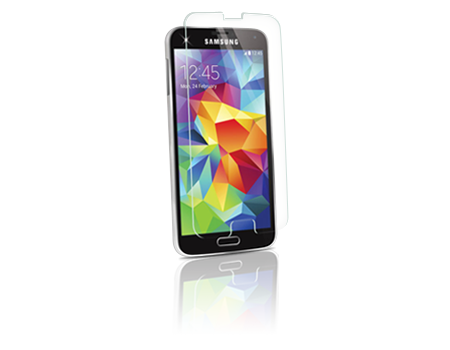 The specially designed glass of the BodyGuardz Pure Tempered Glass Screen Protector provides a powerful solution to protect your Samsung Galaxy S 5. ScreenGuardz® Pure™ is an ultra-thin layer of chemically-tempered glass exceeding the hardness of steel. The clarity and touch sensitivity of this protector is unlike anything available on the market today. No matter what you're protecting, ScreenGuardz Pure is the clear choice. When it comes to touch screens, nothing tops the functionality, feel and clarity of glass. The same is true of screen protectors. ScreenGuardz Pure is made from a special chemically-tempered glass exceeding the hardness of steel. Performance is ensured by a smudge-resistant coating, coupled with high touch sensitivity. ScreenGuardz Pure premium glass screen protector is the clear choice.